The 38 cm placed at MKB 6/ 501 Nötteröy was after the war sent back to France. However there were some problems. 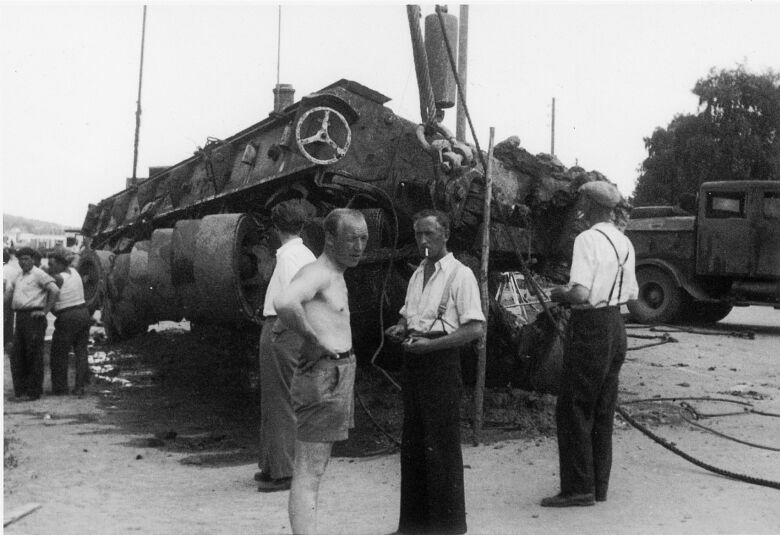 During the transfer in 1947, the guns were moved to Toensberg harbour. The guns weighed according to the article 130 tons and the 48-wheels waggons used to transport the guns weighed 60 tons. This weight made a heavy strain on the old pier that eventually collapsed during the night and plunged the guns into the harbour bassin. Later the french ship "Garonme" and the floating crane "Goliat" managed later to raise the guns and waggons. And the lesson is? Check the harbour facilities before placing a 38 cm gun on them! back for the battleship Jean Bart they even send extra ships . On your photo there is a "Schwerlastfahrzeug" with 24 wheels. the barrels 2 and 8 were stil in Germany . I plan to build a Sketchup 3D model of a Vardaas emplacement after present projects are finished and correct serial is always a bonus. In a list of guns of the Kriegsmarine dated 12.2.43 that you had posted on this forum, there is no (f) on the designation. See below. Was it a typo on the list? Do other German documents show the (f)? Thank you very much, Jos. I wonder if the reason for the Germans not to add an (f) is that they actually mounted the French barrel on a German-designed carriage ("Schießgerüst C.39"), the same one as for the 40,6 cm SK C/34. Therefore, the only thing French was the barrel. I see a parallel in the designation rule with the 7,62 cm Pak 36 with no "(r)" or the 7,5 cm Pak97/38 with no "(f)". A other picture from after the war from Kystfort Forum from the 38 cm barrels . These should be the gun turrets of the Jean Bart ?? at St Nazaire ( Chantiers de Penhoet ) according to the Ebay caption . I was thinking the same , never trust Ebay captions. Found the numbers of the German Bettungsschiessgerüste C.39 of the French 38 cm gun . The Jean Bart had 152 mm inch dual purpose secondary turrets not fully fitted(wing turrets) on sailing and these appear to be the ones shown. However the french had a new class of light cruiser under construction, De Grasse, and these could have also been for these ships. From a norwegian army list from 1945 with details regarding the barrels. The roman numbers (i-ii-iii) refers to each of the 38 cm gun positions. (Riksarkivet).